The temperature will drop to the low to mid 30s Wednesday night. Tuesday is not as chilly, but it's still cool for this time of year. For now, we are forecasting rain and highs in the lower 50s. We'll be watching that thunderstorm chance very closely over the next few days. The NWS Storm Prediction Center has issued an area of *enhanced* risk across the ArkLaTex, and a *slight* risk for much of NELA for severe weather on Friday. Saturday evening's sunset was a beauty, despite there being lots of clouds overhead. Thursday another disturbance makes its way in, this will also impact northern counties more compared to southern counties. Thursday will be a bit warmer but cloudy with rain possible. Temperatures will be in the 70s on Wednesday before dropping to a high of about 64 degrees on Thursday. 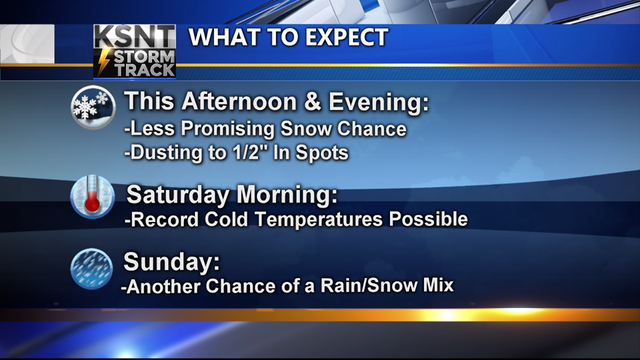 Late in the weekend, a strong cold front will renew the chance for stormy weather. No travel concerns here as temperatures hold strong in the 40s. just what the farmers ordered. Friday will be breezy. Thanks to a southerly wind beginning yesterday and continuing today, we will be warmer this afternoon than yesterday. Early estimates suggest temperatures will be in the mid-60s. Be patient! We could see high temps reach the low 50s mid and late next week. Tuesday night: Clear with a low around 50. Afternoon highs may stay in the 70s as rain coverage sharply increases. Then, during the day, we rise to near 70 degrees with sunshine in full supply. First Alert: Weekend Storms? . High pressure will build into the area on Sunday. Showers are possible Wednesday night and rain is likely Friday and Saturday. For now we will forecast a good chance of rain and storms Saturday and Saturday night, ending Sunday morning. Temperatures will reach the low and middle 50s, which is still a little cooler than normal. Clouds and cold air dominate Monday.